Ideal when measuring the flow of fluids under high pressures, such as in hydraulic testing. 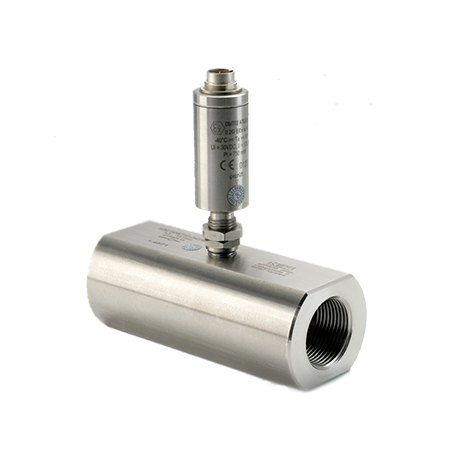 It is also perfect for chemical injection systems, as it withstands pressures up to 20,000 psi and is available in a variety of different flow ranges. The HM series of turbine flow meters is ideal when measuring the flow of fluids under high pressure, such as in hydraulic testing. It is also perfect for chemical injection systems, as it withstands pressures up to 20,000 psi and is available in a variety of flow ranges (0.08 to 32 gallons/minute). Standard process connections are AutoClave®, but are also available in Grayloc® and Techlok®. A complete line of hazardous area approved sensors and displays are available as well. High Pressure Suitable: The HM Series of turbine flow meters can handle low viscosity fluids flowing under extremely high pressures, such as hydraulic and fuel systems and offshore chemical injection systems. Hazardous Area Approved Sensors: A complete line of hazardous area approved sensors and displays are available for the HM Series meters. Durable & Cost-Effective: This meter’s rugged stainless steel construction provides a durable and economic flow metering solution to sanitary environments.